Last winter, I posted a series on historical sleighs and sleds. I'd like to continue along this vein and start the new year off with a historic look at snowshoes. 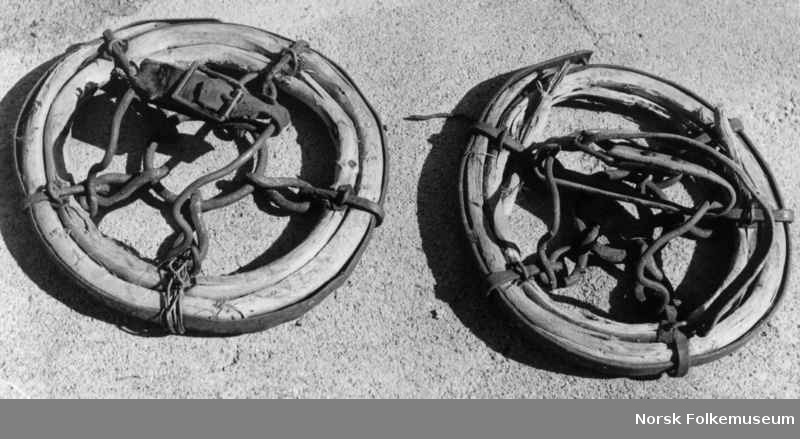 For starters, did you know that snowshoes were also made for mules and horses? Putting snowshoes on horse, about 1900. This ca 1900 image from the McCord Museum shows the round type of snowshoe made specifically to hold up one-quarter of the horse so his weight would be evenly distributed as he walked. Although the McCord Museum contains a huge amount of online digital material, it is located in Montreal, Quebec, Canada and therefore this image is probably from that locale. 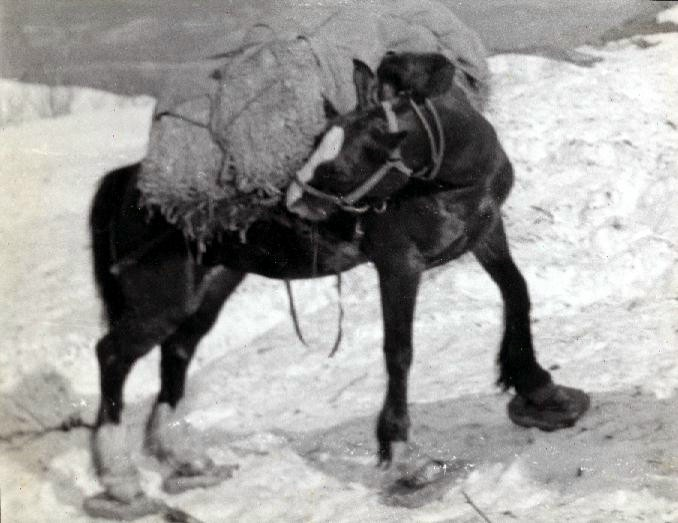 This next image of a horse on snowshoes comes to us courtesy of the Stewart Historical Society Museum out of Stewart, British Columbia, Canada. Curious, I researched these equine snowshoes and discovered the Norsk Folkemuseum in Norway has many on display at their Digital Museum. 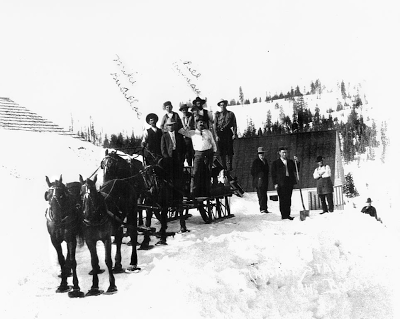 Even the U.S. got into the act because here's a photograph from the Soper-Wheeler Co. from La Porte, California showing The La Porte Stage ca 1911 with their horses wearing the fashionable snowshoes. Although the above photo is pretty special in my opinion, what set La Porte, CA in the record books was that it's the site of America's first organized downhill ski race using 12-foot snowshoes, back in the late 1800s. Yes, indeed. It seems that back in the mid 19th century, a Norwegian by the name of John Thompson (1827-1876) was searching for his fortune down in California. 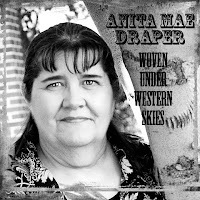 After trying his hand at prospecting and ranching, he heard about the struggle to bring mail to communities over the Sierra Nevada mountains. 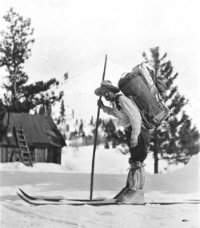 He made a set of 10 foot wooden skis and a long pole to propel himself forward based on the ones he'd known back in Norway. They were heavy boards that looked like skis - nothing like the flat, shaped ones used by American natives, Canadians, and others in the West. In 1856, John 'Snowshoe' Thompson made his first mail delivery over the Sierra Nevadas. It was the beginning of a twenty year career which gained him admiration and accolades when the people realized he could indeed get the mail through. 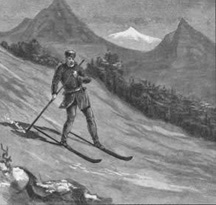 This illustration by William M. Thayer, ca 1890 depicts "Snowshoe" using his pole and long oak skis. 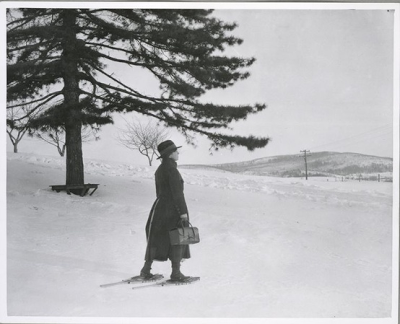 In contrast, this Rural New York nurse is wearing a common snowshoe, typical in most snow-laden parts of Canada and the United States. We still have this type, bought in the 1970's and hanging out with our ski equipment. I have more images of snowshoes, skis and skates, etc, so stay tuned for the next post in this series. So, what did you think? Were you educated or entertained by this post? Definitely educated. Snow isn't something we give much thought to on the Virginia coast. On the rare occasion it comes, we shut everything down and the kids play with random items we affectionately call "ghetto sleds." i'm always educated by your posts, anita - and i enjoy them as well. in Colorado, i had quite a few friends who loved to snowshoe race in Summit County (which has quite the array of snowshoe trails). the snowshoes were pretty teckkie too. i never tried it, but i think it would be fun. i also think it would be very interesting to see a horse with snowshoes on - LIVE. i do like the pictures, i guess i'd like to see it in action (the animator in me). LOL, Dina, I know what you mean. Even up here where we can walk into most department stores and spend oodles of bucks on snow scooters, inflatable tubes, and fast flying snow riders, sometimes the most fun is from a plain old piece of cardboard. Hey DebH, I wondered if you'd got some snowshoeing action in over the holidays, being an active sports enthusiast. Yes, those lightweight modern snowshoes are great! I'll be showing a pic next post about an older version of the racing snowshoe and it looks like they're racing over hurdles! Talk about extreme sports. I could only find one video reference to equine snowshoes and it's Bill Balfrey's, Mules on Snowshoes which is based on his lecture to the Back Country Horsemen of California. I can't be certain, but this film is possibly made up of still photographs as there is no reference to live action. Also, unlike the images I've shown in the post, Bill Balfrey's equine snowshoes are square blocks of wood and metal that must've been heavy for the horse to wear. 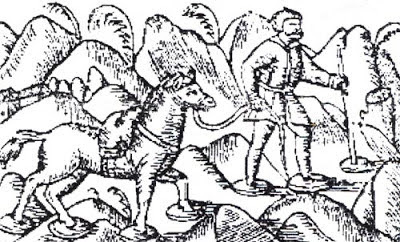 Actually, I've gone back to my post and believe some of those pics - like the one of the pack horse turning his head - looks like they use the square blocky snowshoes, too. I was looking at the front legs before and assumed they were the round ones. It was only after seeing a different page of Bill Balfrey's site earlier today that I became aware of this type. For all I know, the stage line might be using the square ones, too. Anita, I'm sorry! I left a comment this morning ... I don't see it now and came back to see what you'd responded. ugh! I have never heard of snowshoes for horses before. fascinating! I haven't owned a real pair but had a fun pair when I was a kid. It sure makes life easier though I try to avoid those situations when I can. Walking through deep snow is quite a work out! I really love the photo of the nurse by Hines. Wonderful. I saw the prettiest pink snowshoes in a catalog. They made me wish I had somewhere to wear them. Once in a while they offer a snoeshoeing class at my local college. Every Saturday (when they have the class) they go up in the mountains and learn to snowshoe. I do think it would be so fun. Educated, most definitely! I've never tried snowshoes, and had no idea they had them for horses. I have, however, tried my hand (feet?) at cross-country and downhill skiing. That picture of "Snowshoe" Thompson made me chuckle. It used to be (in the old days, 30 years ago) that the longer the skis, the better skier you were thought to be. Nowadays, skis are shorter, shaped, carefully balanced, and engineered so that downhill is easier than ever to master. Sigh. The humiliation I could have avoided during those high school ski trips that were part of our phys. ed. program. Hi Debra. I wondered where you were today. I waited so long for comments after DebH and Dina's that the day went on and I forgot to check back. eeps. sorry. I learned how to snowshoe when I was on a winter exercise with the military, but we couldn't keep those ones. Like I said in the post, our store-bought ones are long teardrop shaped. It gets some getting used to, but the secret is in the gait. Keep lifting your feet. LOL. Yes, Suzie, it would be fun to use the lightweight modern ones as they aren't as awkward and it doesn't make you feel like you're straddling a horse. I used to do a lot of cross country skiing - still have my equipment - but the last time I went out, I fell and had a heck of a time getting up in the deep snow. Niki, those phys ed ski programs are still going on. LOL. Our kids go once a year, every year, and have learned quite well as they go down the Intermediate trail. Nelson took me out downhill one year and he went up and down the mountain 4 or 5 times in the time it took me to go down the bunny trail once. I never went back. Give me cross country skis where I can pick the hills of my choosing and don't need a lift to get there - well, unless it's a lift from an automobile. Ha. And I thought of another anecdote... Nelson spent 7 years in Germany as a youngster, and learned to ski in the Alps. Yet, his mother wouldn't allow him to play hockey because she said it was a dangerous sport. Alone, that sounds pretty good,eh, but when Nelson got his first pay check, he spent it all on brand new downhill ski equipment. Then the first time he used it, he fell halfway down the mountain and broke one of his skis. And he still has those yellow boots! But he could have been seriously injured. Is it only me that thinks charging down a mountain on two narrow sticks of wood is safer than a friendly game of hockey?